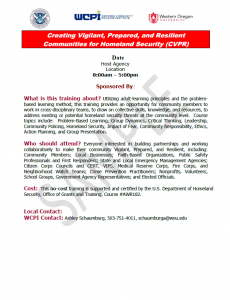 This course is created to expand and sustain homeland security leadership across the country. 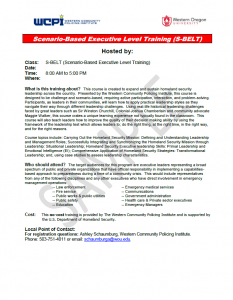 Presented by the Western Community Policing Institute, the course is designed to be challenge and scenario-based, requiring active participation and problem-solving. 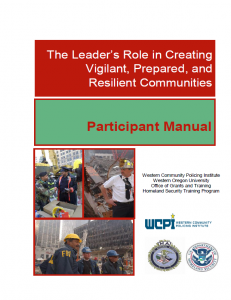 Participants, as leaders of their communities, will learn about leadership theories and traits that will assist them in planning and preparing for a National or domestic all hazards catastrophic event. This course will use historical figures and a pandemic influenza case study to examine and discuss how leaders, at critical times, can do the right thing, at the right time, in the right way, and for the right reasons. This course is designed to provide “hands-on” practical training activities that lead to providing executives with the leadership skills needed in an “all-hazards” event. The course consists of six modules which are identified below. These modules include classroom instruction, real-life scenarios, and practical activities. 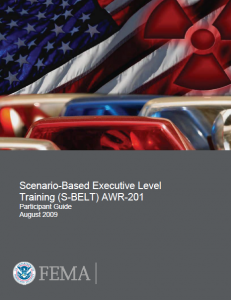 This one-day course is designed to increase public safety executives’ level of terrorism awareness and preparation skills to engage the community in all-hazards and anti-terrorism strategies through partnering with federal, state, and local agencies. Through this highly interactive training, public safety managers and executives will team up with other agency personnel to share strategies and successes. 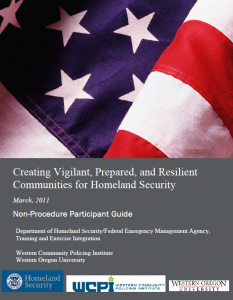 Using a practica and real-life scenario, participants will identify community resources to be deployed in a real terrorist incident, natural disaster, or any event of national significance. In this course, participants will: Learn about Federal, state, and local anti-terrorism and homeland security resources, determine the preparedness needs of their jurisdiction, identify specific goals for higher levels of community preparedness in their jurisdictions, identify community partners who will assist in identifying and addressing preparedness gaps, use an implementation model to prepare an action plan, and evaluate methods to achieve identified goals for their jurisdiction. Upon course completion, participants will have developed an initial plan for addressing anti-terrorism and all-hazards issues of vigilance, preparedness, and resiliency.